It’s the day before Prince Harry marries Meghan Markle, and Catherine and Marcello are dressed for the occasion. Catherine wears a vintage wedding dress, probably from the early 1960s, while Marcello dons David Bowie for Target pants. His burgundy top hat is from the Metropolitan Opera, made by the same hat-maker who crafted pieces for Judy Garland. The two mannequins live inside Guido in L.A. on 7th Street in downtown Los Angeles. 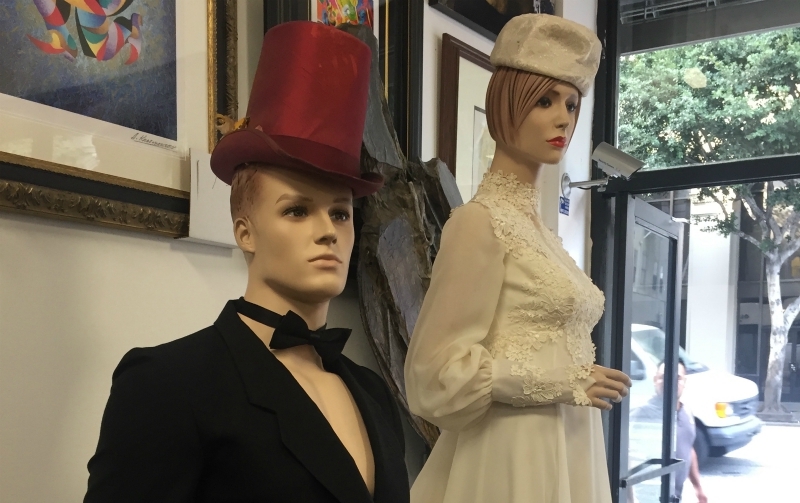 Owned by Jason and Victor Perez-Galloway, the vintage shop is named for their dog (who in turn is named for Marcello Mastroianni’s character in 8 1/2 ) and is packed with everything from band T-shirts to designer gowns. Guido in L.A. reflects Jason’s deep love of fashion and his and Victor’s passion for film. Their first date, Jason says, was to see a David Lynch concert at the nearby Theatre at Ace Hotel in 2015. They’ve been married now for two years. The following Friday, Catherine and Marcello are ready Memorial Day Weekend. She’s in a Hawaiian-print dress and he’s wearing a tiki shirt, items that Jason found in Palm Springs. “They’ve been so fun for me to dress,” says Jason. Catherine, Marcello, and the other display figures inside the shop are conversation starters, and Jason, who handles most of the day-to-day business, has a wealth of knowledge to share. Back at FIDM, he worked with the costume collection and did presentations for classes. He loves researching fashion and passes along his knowledge about famed and obscure designers, their connections to film, music, and history. The collection spans decades. There’s an orange and cream dress from the 1960s by John Doyle Bishop. (“I found out that he was a big designer in Seattle and he was openly gay at a time that a lot of people weren’t and that’s kind of cool,” says Jason.) Nearby are a few Betsey Johnson items, pieces that would make ’90s teens drool over the pages of Sassy magazine. The stock reflects the eclectic style of downtown customers with a mix of classics and on-trend finds. Jason sees a lot of what he calls “’90s kids” looking for clothing from the era of Riot Grrrls and Fly Girls. “I can sell the hell out of a silk bomber with clocks all over it,” he says.